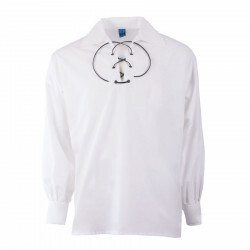 This is the traditional jacobite ghillie white shirt intended to be worn with a kilt. This cotton white shirt is part of the traditional Irish costume entailing a kilt and a spencer jacket. It is often worn by musicians or for weddings and other formal ceremonies. The leather string for the collar is included. More sizes may be available in our shops so do not hesitate to contact our Customer Service at +33 (0)2 98 85 47 37 or by email. If the size you would like to order is not available, we can order it for you and it may take up to two months to be delivered by our supplier. As this item runs large, we advise that you order a size below your usual size.